The European Space Agency's GOCE satellite has been on a quest to study the Earth's interior, from space. Now the results are in, and a pioneering effort to map the Earth's gravitational field in high detail, has just been published in the journal Nature Geoscience. It's giving researchers an unprecedented look at our planet's mantle. 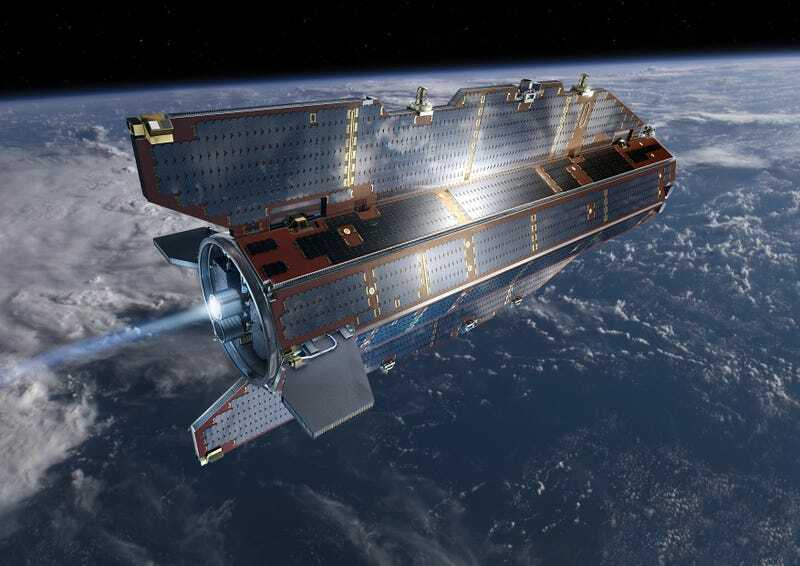 The Gravity Field and Steady-State Ocean Circulation Explorer (GOCE) was the first of a series of ESA satellites built to study the Earth's gravitational field. This is no easy feat, especially at the level of detail the ESA's Living Planet Programme was aiming for, where even the tiniest on-board movement can throw off the reading's accuracy. As such, the GOCE was the first satellite to be entirely solid state, the entire spacecraft is one big integrated gravity-measuring sensor that detects variations in the earth's pull by measuring the gravitational differences between group of on-board test masses. The subtle pulls between these test masses allowed the satellite to indirectly measure the variable densities of rock up to 1,242 miles below the surface—including subduction zones, whose movements propagate the Earth's volcanic activity. "Ultimately, volcanic activity and earthquakes occur because of these slow movements inside the Earth's mantle," Dr Isabelle Panet from the Paris Institute of Earth Physics, France, told the BBC. "The volcanoes and earthquakes are, if you like, just the surface expression of these deep dynamics."